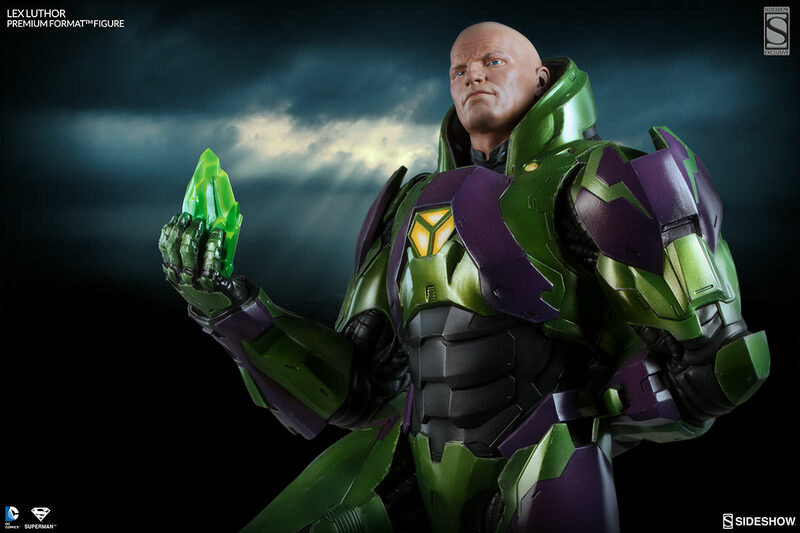 Sideshow Collectibles has revealed their coming Lex Luthor Premium Format™ Figure and I will now give my initial thoughts on this piece based on the material currently available. This should not be considered a review, but rather as my first impression of the piece. The new Lex Luthor Premium Format is a long awaited piece by Sideshow Collectibles. Obviously, the character is arguably Superman’s main nemesis, and the one true villain of the Superman mythos. I’ve always expected that if they were to make a Lex Luthor statue, it would feature Lex in his Power Suit. Elsewise, it would simply be a man in a casual suit, which would be very unremarkable. The more I look at this piece, the more I like the intricacies of the armor, and the flow of the design. In my opinion it looks very solid. 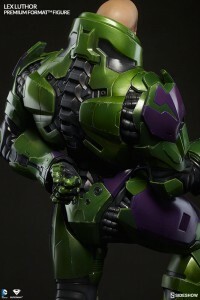 Sideshow Collectibles has managed to make the armor or power suit look very powerful and sturdy. 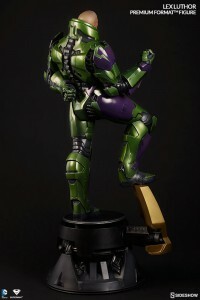 It strikes a good balance between armored pieces (that allign neatly) and flexible sections of the underlying mechanics. Despite the fact that this is of course science-fiction, the armor looks somewhat believable and realistic. 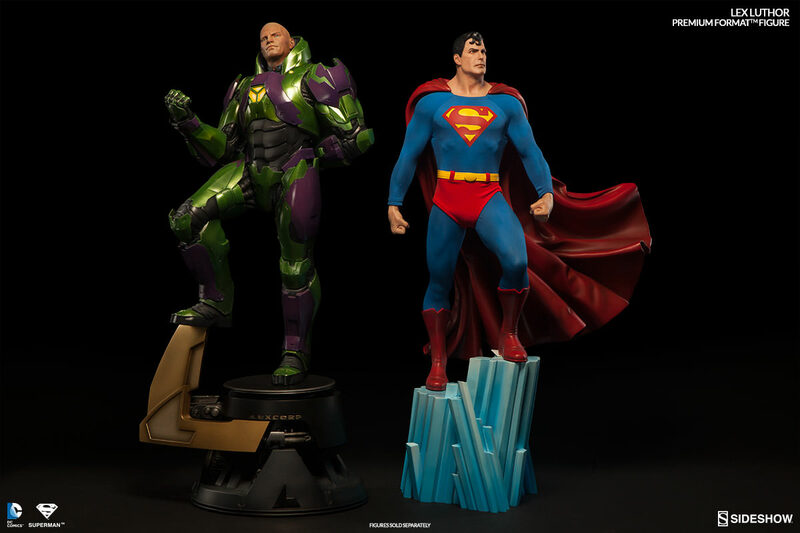 That is of course important when it comes to Sideshow Collectibles’ line of DC Comics Premium Formats that all have this realistic feel to them. The portrait of Lex is what really attracts your attention. 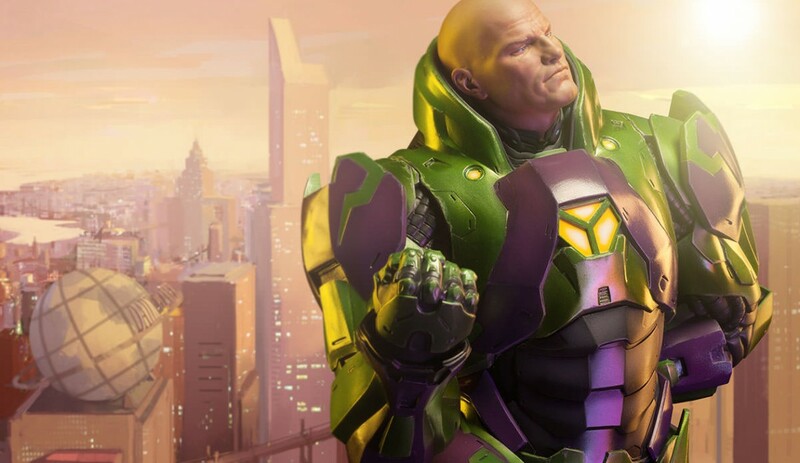 I find it to be a perfect rendition of Lex Luthor. 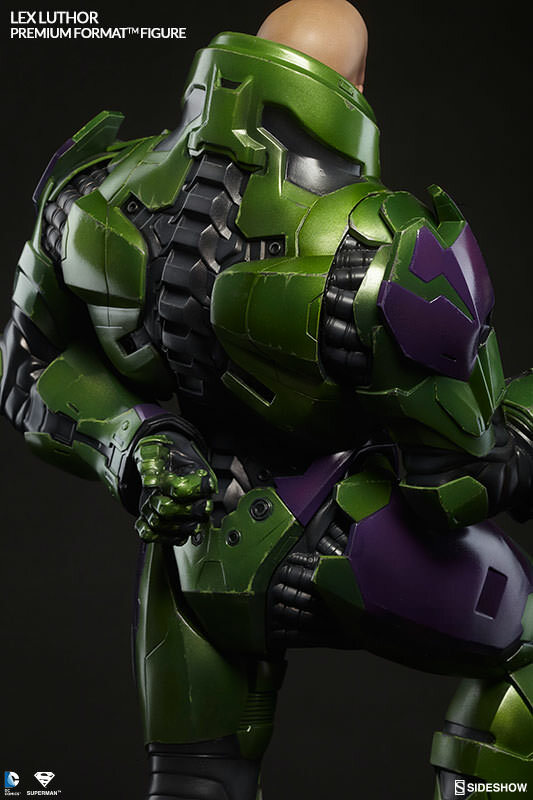 He looks a bit more meaty and seems like a very powerful man; someone you would feel intimidated by even though they weren’t wearing that armored power suit. This is very important, I think. Without being an expert on Lex Luthor, I’d say that the inspiration for this piece can be found in the artwork of Frank Quitely as Lex appears much like we see him in JLA: Earth 2 by Grant Morrison and Frank Quitely. Lex is sporting the classical “Captain Morgan” pose here. When it comes to statues being announced, this is probably one of the most infamous poses. 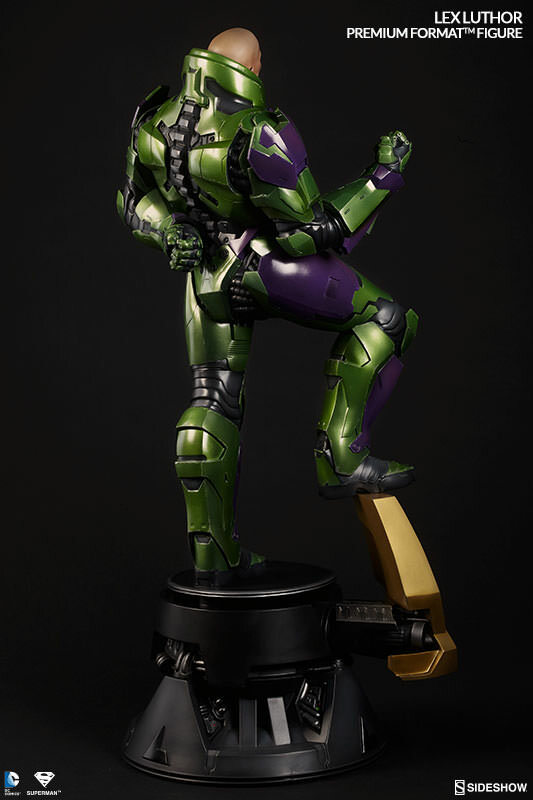 Mainly due to the fact that we see this pose on far too many statues coming out. You can’t deny the fact, however, that it is a “good pose” for a reason. It offers an organic pose that adds dimension or depth to the piece, and it gives it a doze of attitude and expression. You could say that it even conveys a bit of personality. 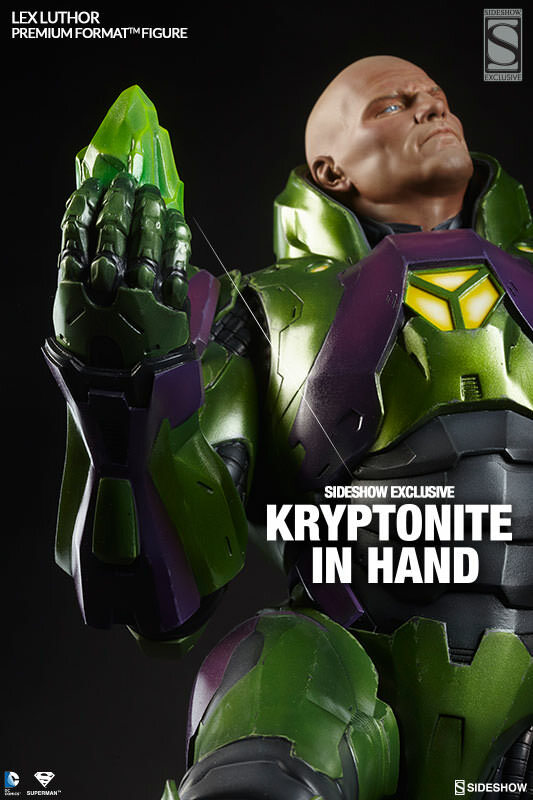 I look at it like this: If Sideshow Collectibles were to use this pose on a statue… Lex Luthor is probably the ideal character to actually use it on. So forget about the past, and just look at this piece as it is. It’s 100% fitting to this character! His right arm is raised in a fist. Conveying power or force. 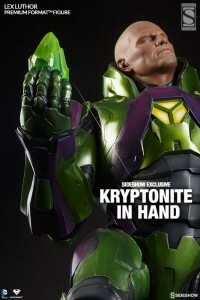 It gives you a feeling of aggressiveness, which falls in line with Lex’s villainous role. His left arm is positioned behind him. This contradicts the expression of his right arm by conveying (upper) class or style. 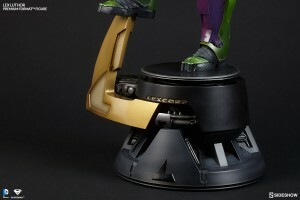 It conveys the keen thinking of Lex, and makes him look like a leader or almost a dictator. It’s not hidden fact that Lex aspires to become a leading political figure after all (or at least a man of influence). The Exclusive is the unsurprising bit of Kryptonite. 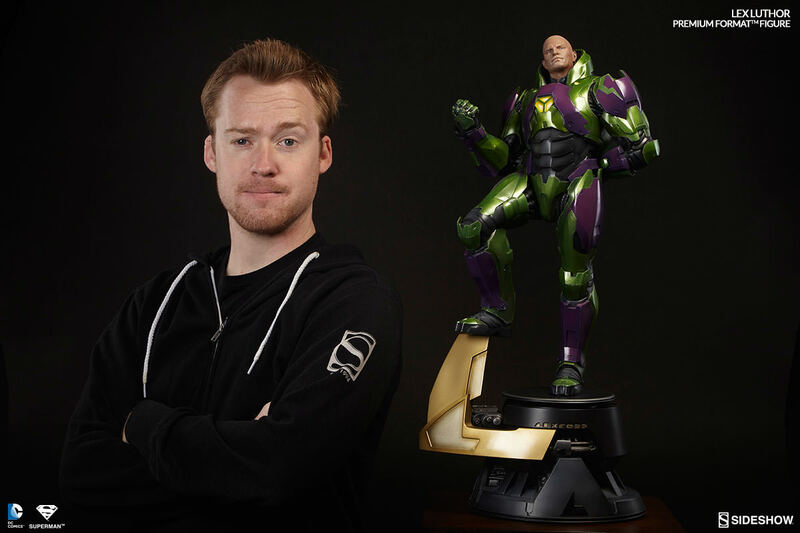 It makes very good sense to add that to a Lex Luthor statue, and with the pose of Lex it fits extremely well with the piece as a whole. Is it a must? No, but it sure makes sense to get it. Overall, the pose is solid. It’s representative of the nature of the character, in all his diversity. I think this is done well here. The base is probably one of the weakest aspects about this piece. In all honesty, it looks rather uninspired and boring. You have a generic design that doesn’t really look like anything. I mean, what is it actually supposed to look like? Maybe some area in a laboratory or the top of a building? I don’t really think it’s supposed to look like anything in particular. It’s simply supposed to add to the overall theme of the piece with its generic mechanized look. It’s a shame that more work or thought hasn’t been put into designing the base. It’s as if all the focus was on the character, and the base was done afterwards, and they just needed something that would fit that character. 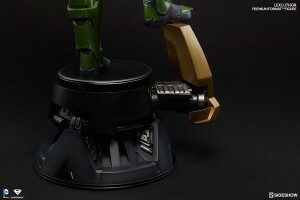 I’m not saying that bases should be filled with bells and whistles, but it would be nice with a base that feels like it has been given the same level of attention as the piece on top of it. The convenient “LEXCORP” text is also thrown into the mix, but it doesn’t really make sense. Why would it say that there? Nah, it feels like they just came up with something that would allow for the Captain Morgan pose, and that’s it. I know that people have had very mixed reactions over this piece, and many collectors have labeled this piece as a definite pass. 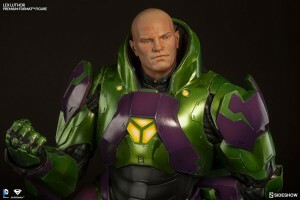 I think that is a shame since I think this is actually a well done rendition of Lex Luthor, and I am having a hard time thinking of a way Sideshow Collectibles could have done this much better – other than improving the base, of course. 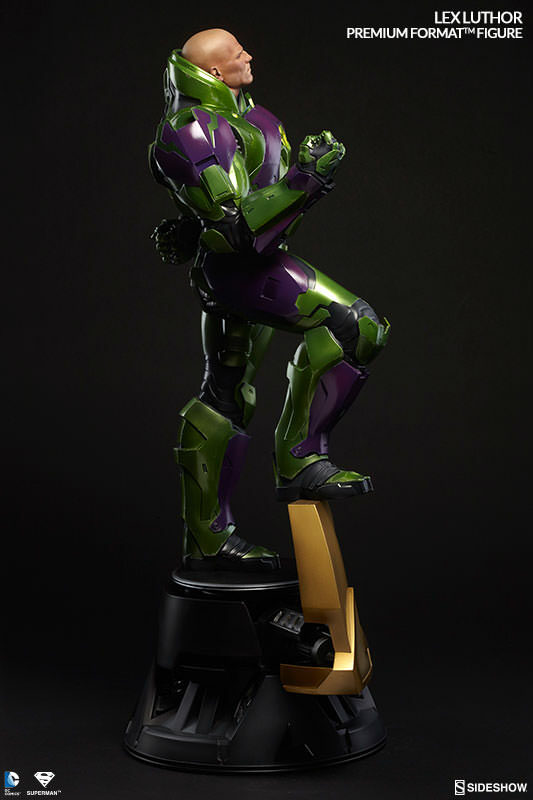 We have the power suit, and it looks brilliant. 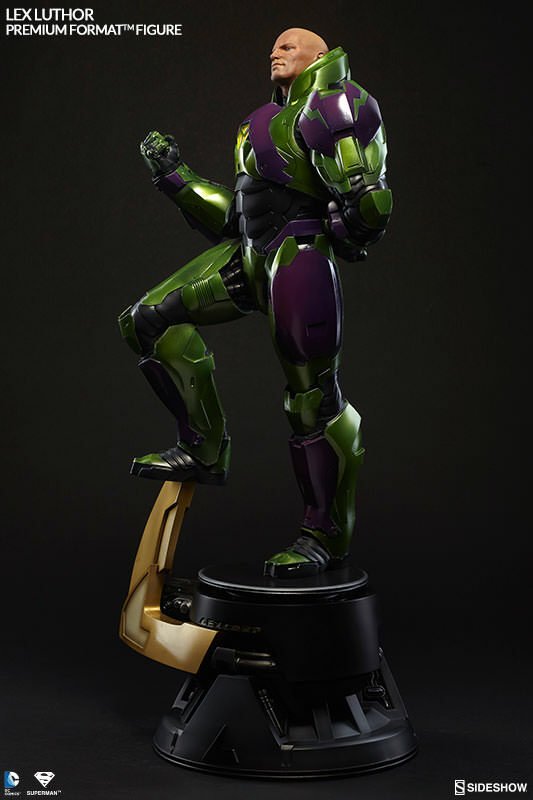 The paint scheme on it with its olive colors looks brilliant. 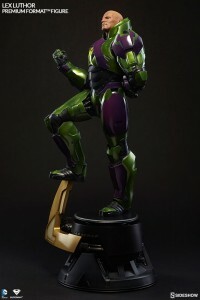 The flow and overall design of the armor is amazing. 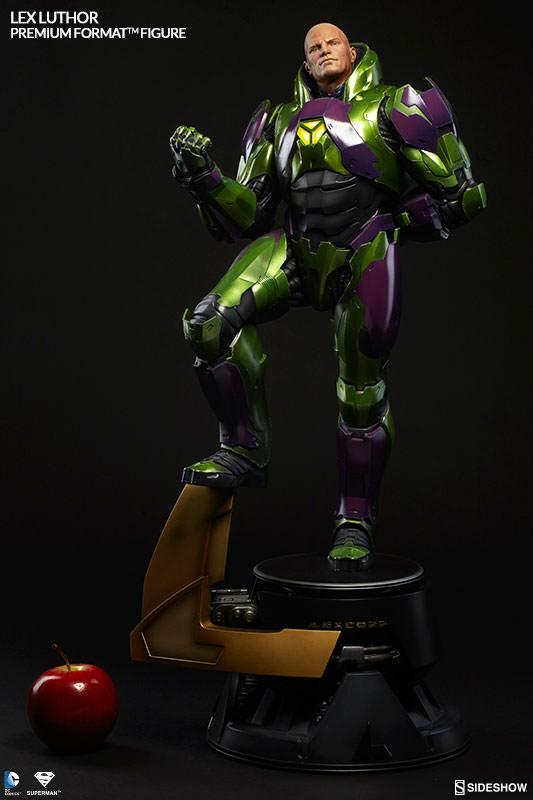 It looks just like Lex’s power suit ought to look. Add a beautiful portrait to the mix, and a Captain Morgan pose that actually works and makes sense(!) and I find that you have a very solid release here. He will look nothing less than fantastic when displayed with the rest of the DC Comics Premium Format family. Superman in particular. 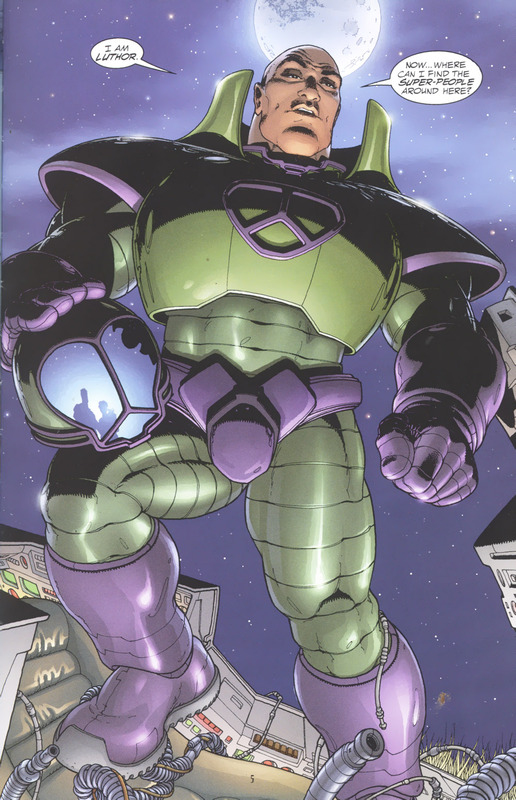 It’s easy and free to say the following, but still: If I had the space and Superman Premium Format in my collection, I’d definitely want to get this Lex Luthor Premium Format as well.